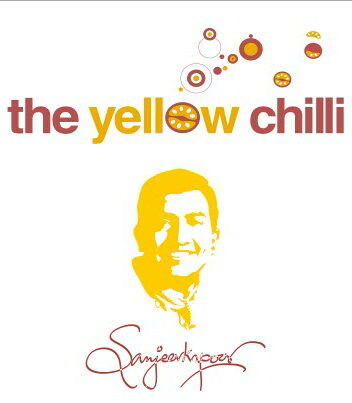 The Yellow Chilli_Ludhiana, a photo by Chef Sanjeev Kapoor on Flickr. With the help of a cookie cutter cut rounds from the center of 4 bread slices, leaving a border of ½” all around. Heat 1 tbsp oil on a non stick pan. Place the prepared bread; add ½ thinly sliced onion in the hole. Cook for 30 secs. Break 1 egg on the onions, sprinkle salt, crushed black peppercorns. When the base of the egg is firm, remove on plate, garnish with 2 tomato slices, few parsley sprigs. Serve. Break 2 eggs each in 4 microwave proof bowls, sprinkle salt, 1 tsp crushed red chillies, 1 chopped onion, ½ thinly sliced green capsicum, 4 tbsps grated cheese. Cook uncovered on microwave MEDIUM (60%) for 2 mins. Serve hot. You can even steam them but for that arrange the eggs in stainless steel katoris and steam in a steamer or a pressure cooker. Grind 1 tsp dhania, ½ tsp jeera, 2 dried red chillies, 1 inch cinnamon, 2 green cardamoms, 2 tbsps water. Sauté 2 cups vermicelli in 2 tbsps ghee till golden. Sauté 1 tsp rai, 3 tbsps chana dal in 2 tbsps oil till golden. Add spice paste, 2 tbsps chopped hara dhania, salt, mix. Add 3 cups water, boil, add vermicelli, cook till done. Add chopped 2 hard boiled eggs, mix. 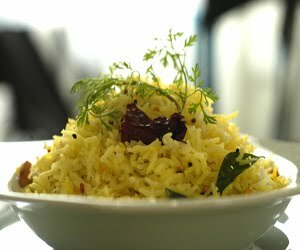 Garnish with 1 tbsp chopped hara dhania, serve. A quick test for freshness is to check if the raw egg in the shell sinks in a basin of water. Fresh eggs stay at the bottom of the bowl while stale eggs stand on end or float because of the large air cell. Other factors such as a weak shell and fine cracks may also cause the egg to float. Good quality, fresh eggs display certain characteristics when broken out. The yolk is small and rounded and stands high in a thick, gel-like egg white, which tends to stay compact rather than spread out over a wide area. As eggs age, the yolk becomes larger and flatter, until it eventually breaks. The thick egg white becomes thin and runny. By this time the egg will also have developed a stale odour and flavour. For more breakfast recipes for the complete vegetarian click on Dalia, Grilled Sprout Sandwich, Mixed Fruit Smoothie. All foodies head toward the Pandora’s box of Maharashtrian cuisine being opened today! PL Deshpande Maharashtra Kala Academy is organizing a food festival titled Mast Mejwani Maharashtra Khadya Mahotsav 2012 from today till Tuesday 28th February. I am presiding as chief guest at the inauguration ceremony this evening – more of a cultural programme at Ravindra Natya Mandir. Honorable Chief Minister Mr Prithviraj Chavan is expected to cut the ribbon. After the book launch of Cooking with Love at Pune on 17th, I went for a short trip to Mysore and Bangalore with my mother. Returned to Mumbai yesterday and after attending the event this evening, I have to prepare for a talk in Ludhiana happening on 24th organized by All India Management Association which is an apex body for management professionals in the country. They have this unique programme for young people called Shaping Young Minds Programme. I had last done a talk for them in last year January. The aim of the workshop is to provide a platform for young professionals and management students to interact with iconic leaders from various fields, helping the participants synchronize personal and career goals through exposure to experience and wisdom of successful people. I am going to focus my talk on my ideas, my mistakes and lessons learnt, life’s teachings, how to enjoy your work and career etc. All carpenters and electricians who had been invading my office all these last months are finally gone! The work is complete and the new extensions are beautifully equipped with new wooden flooring and classy wall paper. I am happy with the new look. The studios have been busy since last Saturday with shoots on for Hungama and Youtube. In our quest to give you traditional Indian breakfast recipes, here are some simple breakfast suggestions. Knead 2 cups atta, salt, ½ cup curd, 1 cup chopped methi leaves, 1 tbsp oil, water to dough.. In bowl mix 2 boiled, mashed potatoes, ½ cup crushed corn, salt, 4 chopped chillies. Divide the dough and filling into 8. Roll out each portion into a puri, place filling in the centre, gather edges and roll into ball. Rest for 15 mins. Roll the balls into parantha, shallow fry with oil till golden on both sides. Serve hot. Blanch 10 almonds, peel, grind coarsely with 20 cashewnuts. Knead 2 cup atta, salt, almonds-cashewnuts, sufficient water to soft dough. Divide 8 portions, roll out into 4- inch diameter disc, spread little butter, sprinkle little dry atta, fold into triangle, roll out into paranthas. Cook on hot tawa with little ghee, turning sides, till both sides are golden. Serve hot topped with butter & glass of milk. 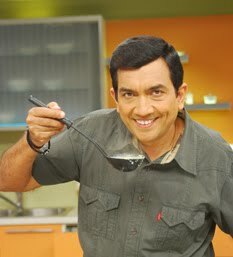 Cook ⅓ cup rajma in 2 cups water, salt till soft, drain, cool, mash. Knead 1 cup atta, 2 tbsps soy flour, rajma, 1 tsp red chilli pwdr, 4 chopped green chillies, ½ tsp anardana pwdr, 10 chopped pudina, 2 tbsps tomato puree, salt, cooking liquour into soft dough. Cover, rest for 15 mins, divide into 10 balls, roll into paranthas, cook on greased tawa on medium heat, turning sides, till light brown, serve with dahi. Take 2 cups atta in a bowl, add puree of 2 boiled carrots, 3 tbsps hot oil, salt to taste, 1 tsp red chilli powder. Knead into a stiff dough using water as required. Divide into small portions and roll out into small puris. Deep fry puris. Drain on an absorbent paper. Serve hot. For more of such ideas of Indian breakfast recipes click on Brown Bread Upma, Kanda Poha, Besan Methi Cheela with Cheese. Top 5 vegetarian recipes for a simple Indian house hold could mean some vegetable preparations like Baingan Ka Bharta or Aloo Wadi, or rice preparations like Lemon Rice or Peas Pulao, or even Aloo Parantha with curd for breakfast! There is such a huge repertoire of vegetarian recipes that it is simply not possible to pin down just 5. But if there is something that could make vegetables more and more interesting for you and your family then it could be worthwhile to go through this. Minding your ‘P’s: If there is one vegetable that invites feelings of extreme, that is peas! Either you love them or you don’t! These can be compared with the greens only as far as the content of vitamins and minerals salts is concerned. What broad beans and peas have in more quantities than most of the other vegetables is sugar and second class protein. One very important part played in our diets is by the dried version of peas and beans called pulses. Of course there is very little Vitamin A in pulses and vitamin C is amiss! Pulses can be used as providers of protein and more so, if had in the sprouted form. Waterless wonders: The most familiar form of dehydrated vegetables are the pulses. More popular on the shelves are the easy to cook variety of branded recipes that make the use of dehydrated vegetables. When there is availability of fresh vegetables these glamorous packets are hopefully a passing fad for quick pre-prepared meals. For more exotic recipes, sun-dried tomatoes, dried onion flakes, garlic powder and onion powder are ready to be bought in specialised food stores. As modern times demand time saving recipes, there is some finery that can go in the freezer. 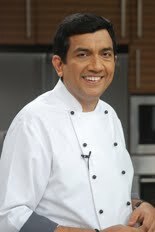 That could also help in formulating top 5 vegetarian recipes. The most common of all the frozen vegetables is the quintessential peas. As the quality of frozen peas has been improving with time, they are easy to cook and taste as good as fresh. Having a few packs of these in the freezer are saviours on many a tricky occasion. Also a new fad are the frozen ready-to-fry branded french fries that seem to be hit with kids. Try something novel like Crusty Potato Fingers. ‘Can’ be a veggie all year: Handy in a tin will come button mushrooms, baby corns, corn niblets, asparagus, artichokes and of course baked beans. They certainly come in handy when the fresh are not available. With this hunt on for top 5 vegetarian recipes, the wave of vegetarianism is reaching its crest, it is possible that variety available such as this will cater to all sorts of palates. Vegetarian cooking is fun and what with the scope for experimentation creativity can be given a free rein. 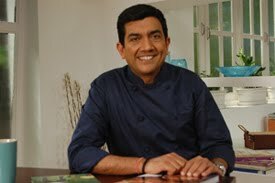 Ready for a shooting schedule for Sanjeev Kapoor’s Kitchen that will last for four days… then on Friday is the most exciting book launch of Cooking with Love Recipes from my Mother’s Kitchen at Westin Hotel, Koregaon Park, Pune. For the very first time we are giving you the opportunity to meet the exceptional masters who have supported and inspired me all through my life! 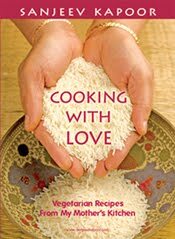 My mother, Mrs Urmil Kapoor and mother-in-law Mrs Lata Lohana are doing live demonstrations of their favourite recipes actively supported by me from my latest book Cooking with Love – Recipes from My Mother’s Kitchen. It has their selected recipes tastefully compiled and showcased in a neat package. There is no substitute for fresh home cooked food made lovingly by a mother! It is extra special, extra tasty and completely satisfying. These strong emotions have been captured beautifully in this new offering. Bonus would be a recipe demonstration by Westin Hotel Pune’s Executive Chef Santosh Jori’s mother! Can you afford not to be there? Entry is by invites only. For more details you can contact: Dhairyasheel on 9987987695 or Shruti on 9765410998. Only 3 days to go! My new episodes are going to be focusing on low calorie, low fat food as there is a high demand for these recipes! Well, you will have to wait for some time and then watch, but as these new episodes are in the process of being prepared you can try out my earlier tried recipes in the meantime. Here goes…..